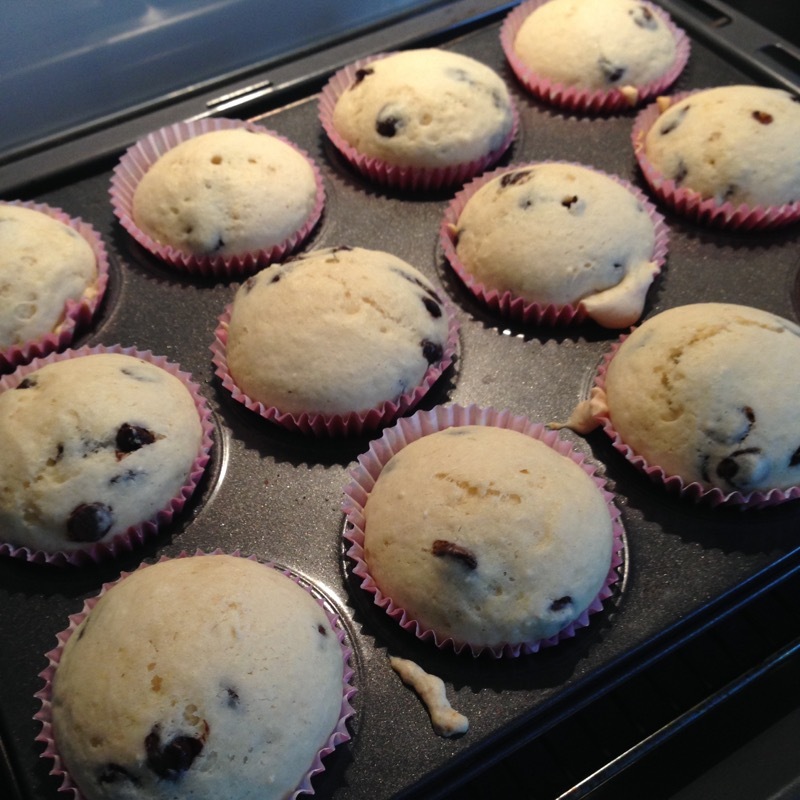 We made chocolate chip muffins during half term. Sophie absolutely gobbled them. That was after she took 20 minutes licking out the bowl (the most peace and quiet I had all week). 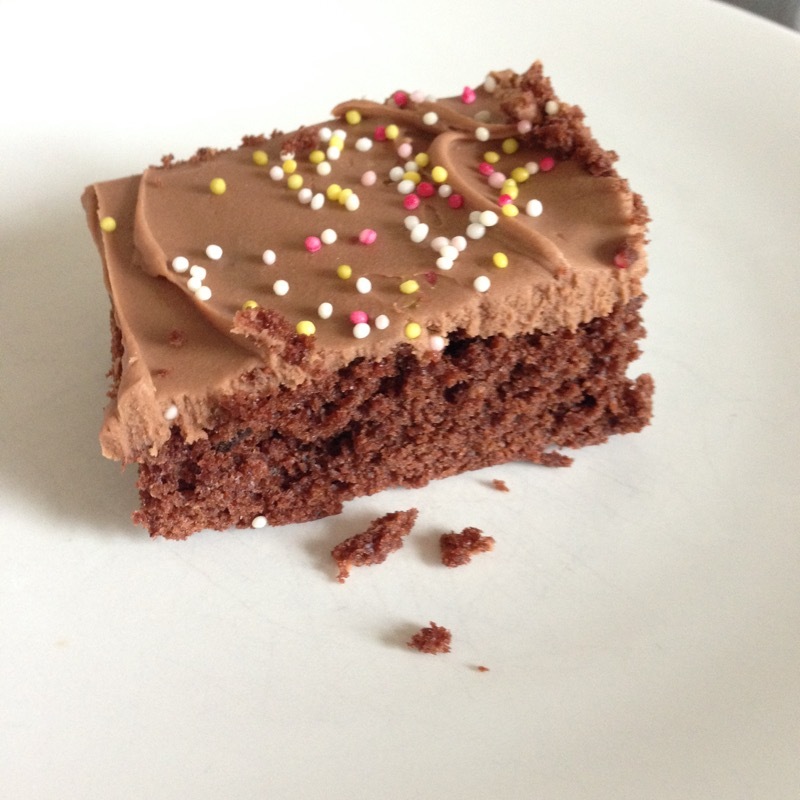 They are very easy and very moreish. Ours came out a little pale because I forgot to take the grill pan out from the top shelf of the oven, so the tops didn’t get browned. They were fluffy and light, though, the best muffin consistency I think I’ve achieved (what is with those homemade muffins where all the filling sinks to the bottom and the whole thing tastes eggy and oily?). Place flour, sugar and chocolate chips in a heatproof bowl, stir together. Beat the egg in a separate bowl with the vanilla. Carefully pour in the melted butter, beating as you go. Add the egg mixture to the flour mixture and mix well. Spoon into muffin cases until about half to three-quarters full. Bake for 15-20 minutes, until risen and golden and a skewer inserted into a muffin comes out clean. I think I’ve finally cracked it! Macarons! Delicate, sweet French confections, devilishly difficult to make. Or so I thought. It turns out that they’re easy when you know how (like most things in life!). The basic macaron recipe below can be varied to your heart’s content in terms of colour, flavour, filling, and decoration. 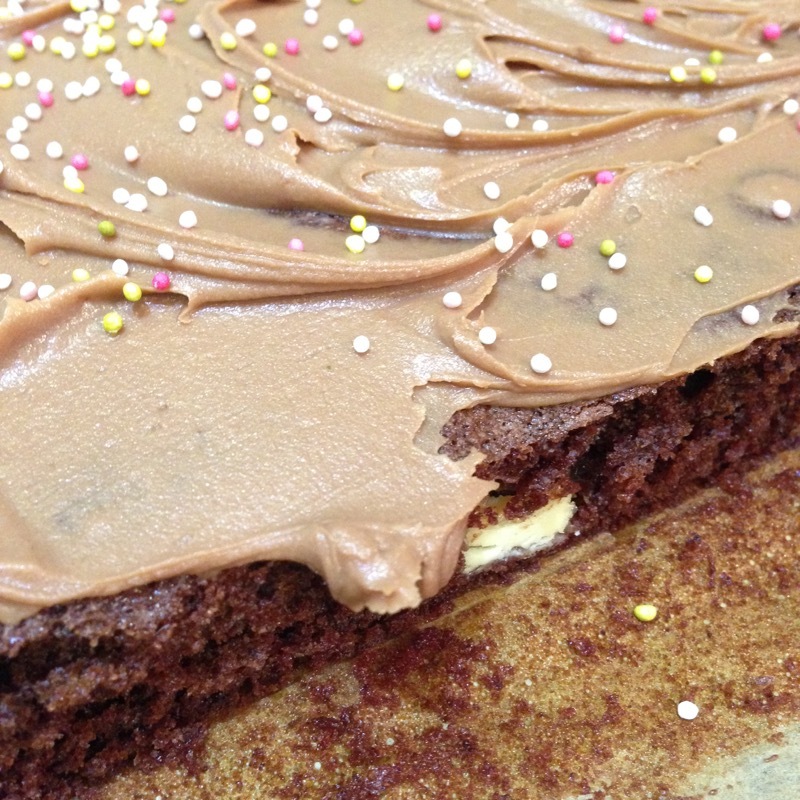 I’ve included instructions for a pistachio and chocolate ganache filling, but other options include creme patissiere, jam, curd, buttercream, cream cheese, or just plain old Nutella (yum!). I use Sugarflair gel colours as they are really potent and a little goes a long way. 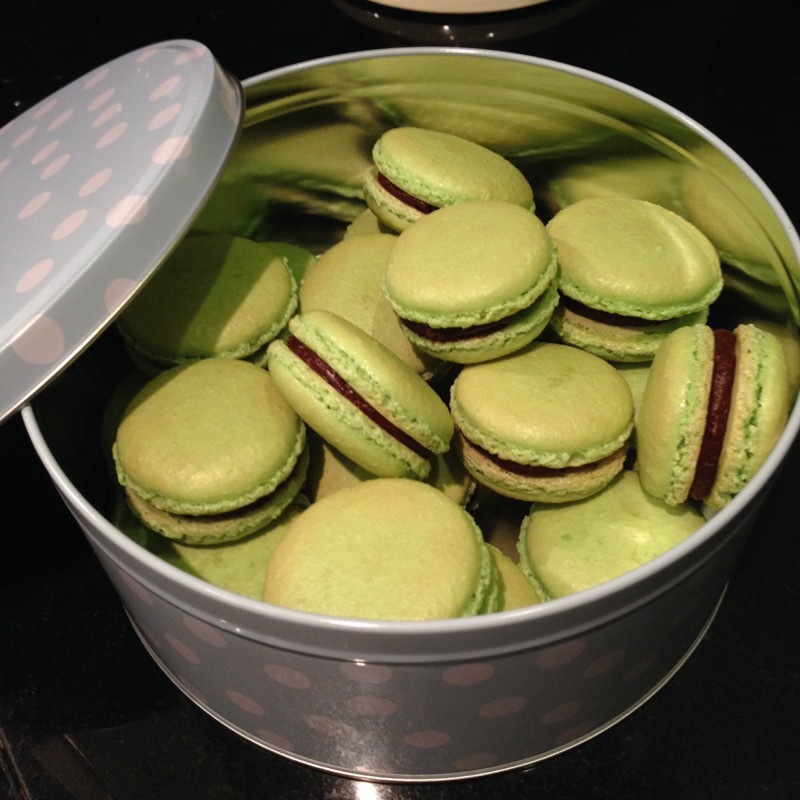 It would take a whole bottle of supermarket food colouring to get the lurid green I wanted for these macarons! They are also gluten free which is great if you know any coeliacs. In a large bowl, or the bowl of a freestanding mixer, whisk together the egg whites and caster sugar. Then, whisk them together for approximately 6-8 minutes (for a freestanding mixer) or 8-10 minutes with an handheld electric whisk. If using a KitchenAid, use speed 4 for 2 minutes, then increase to 8 for 2 minutes, and finally to 10 for a further 2 minutes. After this, the egg whites should be very glossy and stand in stiff peaks when the whisk is lifted out. Add colouring (and any flavourings desired, if you are making a different flavour of macaron) at the very end of the whisking. In a food processor, place the ground almonds and icing sugar. Pulse to combine, then process on medium speed for a couple of minutes. This helps to chop up any bigger bits of almond and ensure the proper texture of the macarons. Sieve the almond and icing sugar mixture over the whisked egg whites. Using a metal spoon or rubber spatula, fold in quickly and thoroughly. You do not need to worry about knocking the air out or being especially gentle, the key is to make sure everything is really well combined. Transfer the mixture to a piping bag fitted with a plain 1cm nozzle. Then, holding the piping bag upright, pipe small rounds onto a lined baking sheet, finishing with a sweep to the side to avoid peaks on top of the macaron shells. Space them about 1 inch apart. 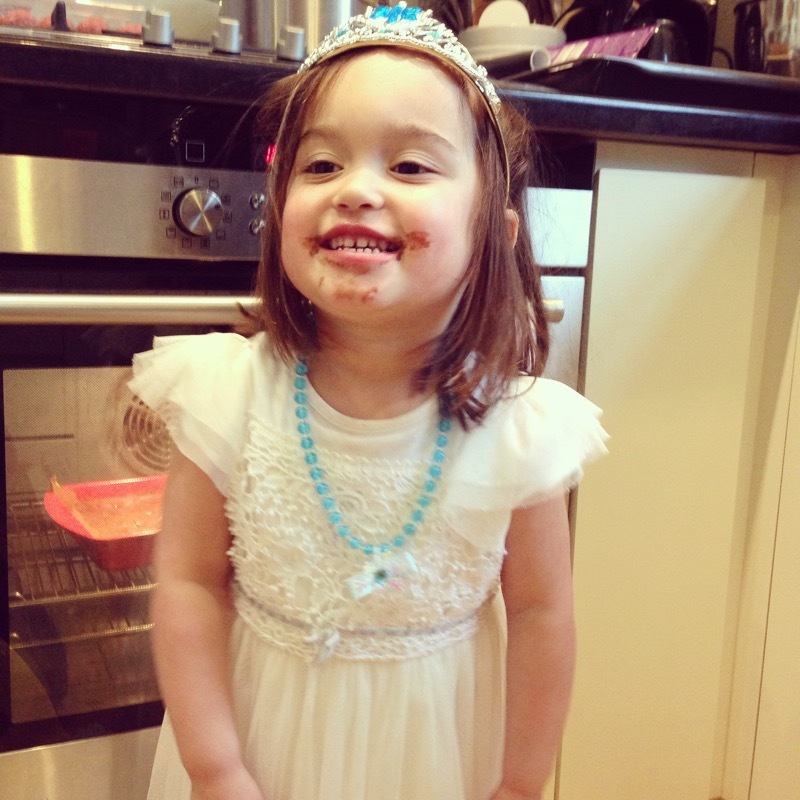 Once all the macarons are piped out – leave them be for at least 15 minutes! Do not touch, poke, or otherwise fiddle with them. They need to form a crust so that they will rise properly in the oven. While they are resting, preheat the oven to 170C and make the filling (see below – there are many, many other options if chocolate and pistachio is not your thing). After the 15 minutes is up, the macarons should be dry to the touch. If they aren’t, leave them a few more minutes. Now it’s time to bake one tray at a time, in the lower third of the oven. The baking time should be between 10 and 13 minutes, depending on the strength of the oven and the size of the macarons. Keep a careful eye on them. They should be set, but not coloured. Remove from the oven and allow to cool on the trays. Then use a piping bag or knife to spread filling onto half of the shells, sandwiching them with the remaining half. Leave in the fridge for 24 hours for the flavours to infuse together. Eat at room temperature. Chop the chocolate into small chunks and place in a heatproof bowl. Finely, finely chop the pistachios, or grind with a coffee or spice grinder. Place the whipping cream, chopped pistachios and a dash of almond extract in a saucepan. Gently heat until almost at boiling point. Then pour over the chocolate, stirring constantly in the middle, until it is all melted and a smooth mixture has formed. Add the butter and stir until melted. This will create a glossy finish. If the mixture is too cool for the butter to melt, microwave in bursts, stirring in between, until it is smoothly combined. Set the ganache aside for 1-2 hours until it is the right consistency for piping. This ganache can also be poured over a cake as a glaze as soon as it is made, or left in the fridge for 8-10 hours and used to swirl over and in a cake, like a buttercream.